I used the scan from minitokyo's gallary and added more colors and styles. I worked on this with my good friend my deviantart so this is a collab. I am sorry but I don't speak very much English. Enjoy. I like the colors and the background. But if I had to say anything I would say maybe make the stroke on them a little smaller because right now it looks not very smooth in a lot of places and a little jagged so maybe a smaller size will help. But besides that's its very cute and the background goes with the scan you used of them. 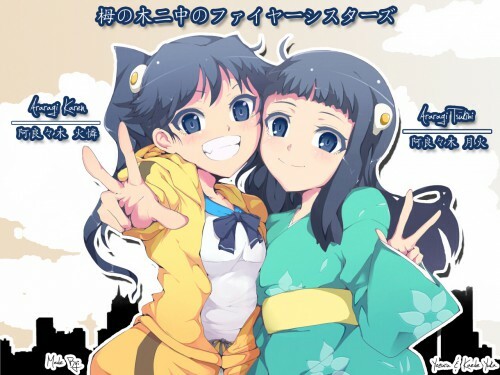 KAREN AND TSUKIHI! You never see anything about them! THANKS! Cute sisters! Thank you for sharing this pic!